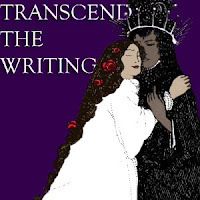 The Society of Gloves: Album Art: "Transcend the Writing"
This is the cover art for the last song we recorded in 2006, "Transcend the Writing." While we recorded the previous three songs in the summer, this one took a while to complete writing, practice, and record. While we produced this one in November, but the origin of the song was during a jam session in the late spring or early summer of 2006. 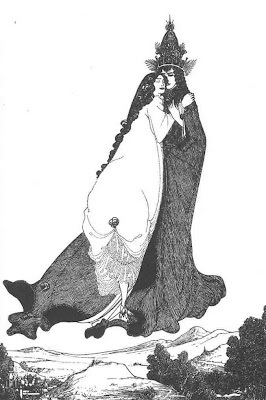 It's basically a colorized version of an Aubrey Beardsley illustration called "The Ascension of St. Rose of Lima." 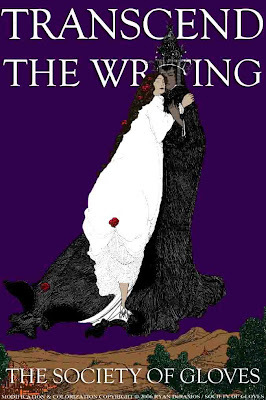 It's from 1896, the same year as the Waterhouse painting visually remixed for "Shield." You can read about Rose of Lima at Wikipedia, as that story doesn't really relate to the song, although the subject of self-martyrdom does sound a lot like the opening lines of the song: "To my life / Weary 'cause it seems / That I need a paid vacation..."
And this is the album art in poster form. I really like how the colors turned out. The Hierophant seems to show different parts of his personality and character, that is, if you try to take the four covers literally. He's a ruler in "White Rhino," a fighter in "Fifty," a discoverer - to say the least - in "Shield," and a lover in "Transcend." Or maybe not. I purposely made the buildings orange, almost showing that the cities are aflame while the two are ascending. Originally, we were going to continue the pseudo-storyline from the "Transcend" woman's point-of-view for future songs, but that idea has long been scrapped.